With the General Assembly of the United Nations taking place this week, Thought for the Day was on the topic of light and darkness this morning. As ever, you can catch up here (scroll forward to 01:21:12) or you can read the text below. These are dark times for our world, so for those of us who believe that Jesus offers hope in the midst of darkness, any opportunity to help people perceive the light, is one to be seized! For me a stained glass window is a transparent partition between my heart and the heart of the world. Stained glass has to be serious and passionate. It is something elevating and exhilarating. It has to live through the perception of light. We live in dark times. The people of Korea, north and south; of Myanmar; of Bangladesh; of the Caribbean; of Yemen all understand what it feels like to walk in the land of the shadow of death. This week the annual UN general assembly takes place. 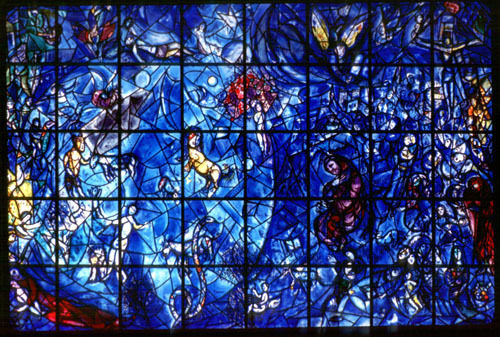 193 member states meet in a large hall near to Chagall’s window to discuss global concerns. And as with any gathering of world leaders, each nation will come with its own interests to defend. The founding aim of the UN is “to save succeeding generations from the scourge of war” yet, 72 years later, the world is rife with conflict and upheaval, and the responsibility for saving succeeding generations weighs heavy on those who will attend the assembly. Human assemblies and political debate exist to encourage us to take action to prevent war, displacement and environmental disaster. For those who are working with patience and determination to find peaceful routes forward our hope would be that they find the inspiration they need. And perhaps as delegates pass the Peace window they may pause and sense the ‘elevation and exhilaration’ Chagall wanted to invoke with his work. Perhaps they may allow ‘the perception of light’ to give them purpose, passion and courage in their decision-making.